Three men have been jailed for their involvement in a £33m drug deal, after the UK's largest ever heroin seizure. Harminder Chana, 32, was sentenced to 17 years, Abdul Rob, 30, to 23 years and Atif Khan, 34, to 15 and a half years. All were from east London. Police said the 730lb (330kg) of heroin seized in the case would have supplied more than 8,000 addicts for a year. 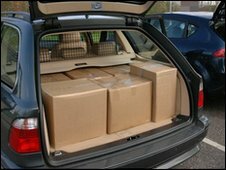 Thirteen boxes were held at a motorway service station in Kent in April 2008, Kingston Crown Court had heard. At an earlier hearing Patrick Kuster, 37, from the Netherlands, was jailed for 26 years for conspiracy to supply heroin. Police said Kuster imported heroin from Holland via Eurotunnel, in the boot of his mother's car. He drove to a service station in Maidstone, Kent, where several people were due to meet him and pick up part of the drug consignment, on behalf of various syndicates. Information led police to Chana, who was seen driving a car into M20 motorway services near Maidstone to meet Kuster and transfer boxes from one car to another. Later, police arrested Khan in Ilford, east London, and found the keys to a "safe house" which led police to more drugs and equipment. Items there showed Khan had a business partner called Abdul Rob, who was later accused of arranging and financing three boxes of the imported heroin. Jailing Chana, he described him as a "trusted lieutenant" in the operation, while Khan was a "middle manager". Khan received a lesser sentence for pleading guilty at the first opportunity. He told Abdul Rob: "I suspect you of being higher up the organisation." In 2001 Rob was given a nine-year sentence for drugs offences and was released in 2005. BBC correspondent Ben Ando said Rob was not directly involved with the collection. But he was sentenced on the basis that he had made numerous calls to Khan on the day and evening of the planned drugs handover, before he realised the police had sprung a trap. He then sent increasingly panicky and incriminating text messages to Khan.